Tinytags provide essential monitoring in warehouses, cold stores and refrigerated delivery vehicles to ensure food and drink products are kept within specified environmental conditions. Bako North Western use data loggers to provide essential monitoring for temperature controlled distribution of food products. Temperature controlled cool boxes are monitored by Tinytag data loggers to ensure food is delivered in perfect condition. Tinytag data loggers are used to monitor the performance of temperature controlled packaging boxes for use throughout the cold chain. Radio data loggers monitor cold stores, while refrigerated transport vehicles are fitted with stand-alone temperature data loggers. Tinytag temperature and humidity data loggers provide essential monitoring for a salad producer during refrigerated distribution. 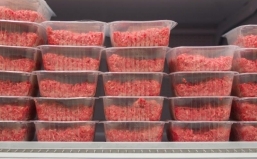 The BFFF helps the frozen food industry understand the importance of using data loggers to help improve temperature management and energy efficiency in the cold chain. Tinytag radio data loggers are used for cold chain temperature monitoring by award-winning brewery. Chilled ready-meals supplier uses temperature data loggers to monitor food cooking processes and cold storage. Tinytag radio data loggers provide essential temperature monitoring for a leading cheese manufacturer during processing, cold storage and refrigerated distribution. Tinytag radio data loggers provide essential temperature monitoring for a leading meat manufacturer during cold storage and refrigerated distribution.